The "Always Write" Blog, now in convenient e-book form. 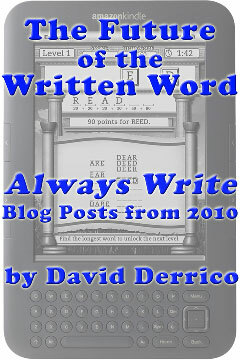 I am pleased to announce that I have just released The Future of the Written Word: “Always Write” Blog Posts from 2010, on both the Amazon Kindle Store and the B&N NookBook Store. It is just $0.99. This collection of blog posts from this Always Write Blog covers developments pertaining to e-books, e-readers, the publishing industry, and my own writing endeavors. It includes all blog posts from the year 2010, a total of 103 posts spanning over 65,000 words, plus pictures. • E-Books: e-book sales figures, availability, reviews, and features (such as lending, text-to-speech, and DRM). • E-Readers: news, tips, and info on e-book reading devices, focusing on Amazon’s Kindle (mainly the Kindle 2 and Kindle 3), with coverage of Barnes & Noble’s Nook, Sony’s E-Readers, the Kobo E-Readers, and Apple’s iPad. • Publishing: commentary on the state of book and e-book publishing, and its future, including discussion of e-book pricing, the agency model, and the future of bookstores and printed books. • Writing: details about the self-publishing “indie” movement in general and my own writing endeavors in particular, including tips for fellow authors on formatting, retailing, and marketing. Please note that these blog posts are available for free here (www.davidderrico.com/blog). However, these e-books are formatted and proofread specifically for the Kindle and Nook, and includes a table of contents, chapter waypoints in the locations bar, all images, and the links to other included blog posts have been changed to internal links for your convenience. It’s a much more convenient way to read all this info on your favorite e-reader. Thanks for checking it out! I hope you find it useful! As always, comments are welcomed below. I am very excited to announce that Right Ascension has recently topped the charts as the #1 best-seller in Amazon’s Kindle Store “Technothriller” category. The sequel, Declination, is also selling better and better, so I am gratified to see that people are enjoying my first novel enough to purchase and read the second one. I would like to sincerely thank everyone who has read, bought, enjoyed, reviewed, or told a friend about my novels. None of this would be possible without you. Thank you! Right Ascension in the Top 500! I’d like to take a moment to sincerely thank my readers, who have helped propel Right Ascension and Declination to new heights. Right Ascension is now in the Top 5 in the “Adventure,” “War,” and “Technothrillers” sub-categories. It also rose into the Top 15 in the “Science Fiction” category, and up to #479 in the entire Kindle store! Lowering the price to just 99 cents each has certainly allowed more people to find and hopefully enjoy my novels. Although I was hesitant to price the novels so low at first, I’m certainly glad that I did it. To those of you buying and reading my novels, I would be eternally grateful if you could spare a few minutes to post a review on Amazon.com. Thoughtful reviews from readers can really help people decide if a book is right for them. If you don’t have the time to write a review, perhaps you wouldn’t mind just helping to “tag” my novels with tags like “science fiction” and some of the other tags that show up about midway down the Amazon page for each book. It really helps! Thanks again for your continuing support… and please feel free to let me know your thoughts on the novels or if there’s anything else on your mind! Amazon, news Comments Off on Right Ascension in the Top 500!